A seasonal rain front dumped record rain over a large area of western Japan, triggering landslides and flooding that hit homes and swept away cars, while authorities urged millions of residents to evacuate their homes. At an emergency meeting, Prime Minister Shinzo Abe directed ministers to "prioritize lifesaving and send rescue crews without delay." At least 21 people were confirmed dead in the western prefecture of Hiroshima, one of the hardest-hit areas, while 12 were killed in Ehime on the south-western island of Shikoku, NHK said. Throughout the affected areas, parked cars sat in pools of water. 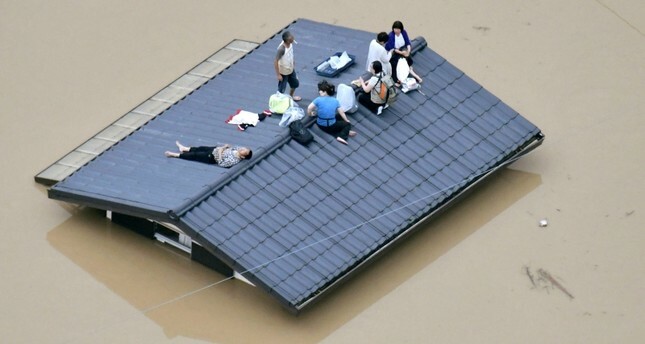 NHK TV said water had reached as high as 5 meters (16 feet) in the worst-hit areas. Kyodo news service, which put the death tally at 34 people, said one death was in a landslide in Hiroshima, which had set off a fire, while the body of a child was found in another area. NHK said a woman died in her home in Hiroshima when it got buried in a mudslide. In Ehime prefecture, a woman was found dead on the second floor of a home hit by a landslide, Kyodo said. Also in Ehime, two elementary-school girls and their mother who got sucked into a mudslide were rescued but their hearts weren't beating, it said. Evacuation orders or advisories were sent for 4.72 million people, and 48,000 members of the Self-Defense Forces, police and firefighters were mobilized for search missions, according to Kyodo. Earlier this week, Typhoon Prapiroon hit south-western Japan, leaving one dead and about 20 injured. The Japan Meteorological Agency upgraded its alert system to the highest level -- only issued when the amount of rain is expected to be the highest in decades -- in large areas of western Japan, while lifting the warning in other regions.